The 2014 Billboard Music Awards Finalists….. ~ Phresh Hott New! 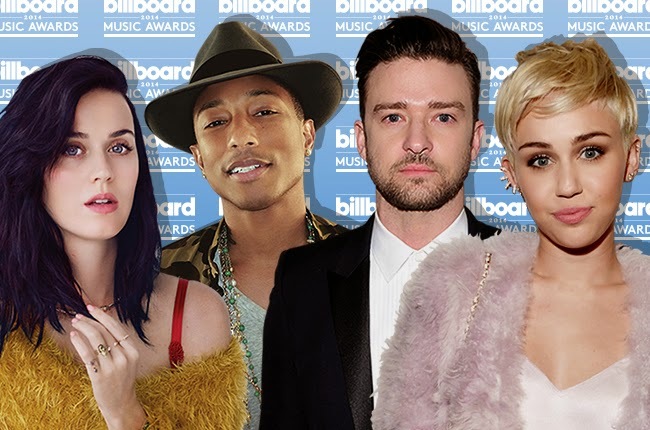 The 2014 Billboard Music Awards Finalists….. The 2014 Billoard Music Awards nominations have been announced. From Lorde, Beyoncé, Justin Timberlake, Miley Cyrus, Katy Perry, Imagine Dragons and more are leading the finalist with multiple categories. Viewing the finalists Imagaine Dragons and Lorde lead in 12 of the 40 categories, Justin Timberlake, Macklemore & Ryan Lewis and Katy with about eight nominations at least. While, Justin Timberkale has the most admissions as a finalist for albums ‘The 20/20 Experience and The 20/20 Experience (2 of 2). Beyoncé album self-titled relese is a finalist in seven categories including Top Female Artist, Top Billboard 200 Artist and Top 200 Billboard 200 Album plus more. Even Pharrell Williams with eight, Robin Thicke with seven and Eminem scores six, meanwhile Rihanna, Drake plus Jay Z with five categories. Don’t forget to tune in for The 2014 Billboard Music Awards on May 18 on ABC Network at 8 P.M. broadcast live from the MGM Grand Garden Arena.